Preheat oven to 400°F. Spray a large rimmed baking sheet with non-stick cooking spray. 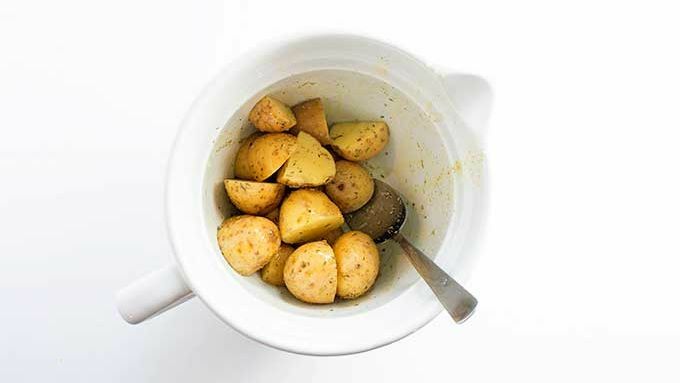 Add potatoes to a mixing bowl and drizzle on 1 tablespoon of olive oil. Top with 1 teaspoon each thyme and rosemary. Stir to coat. Arrange potatoes in a single layer on the pan. 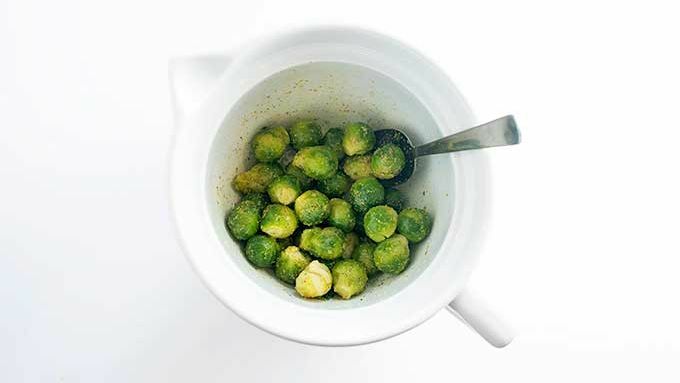 Place Brussels sprouts in the same bowl used for the potatoes and drizzle with 1 tablespoon of olive oil. Top with 1/2 teaspoon each of garlic powder, salt and pepper. Stir to coat and add to pan with potatoes. Rub pork chops with 1 tablespoon olive oil on both sides to coat and sprinkle both sides with remaining thyme, rosemary, garlic powder, salt and pepper. 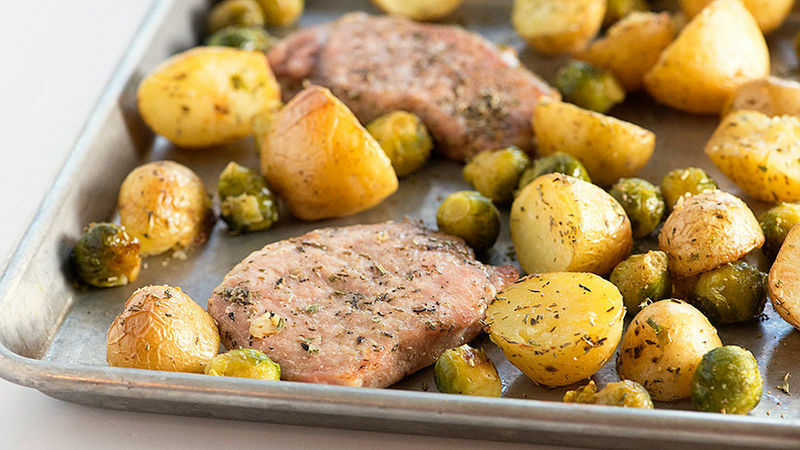 Arrange pork chops on pan between potatoes and Brussels sprouts. Bake for 15 minutes, flip pork chops over, and bake for 20 more minutes. Swap out the thyme and rosemary with Italian seasoning for a different flavor profile. A heart fall meal with only one pan to clean up—it’s a dinner winner. As soon as the nights start getting chilly, I start cranking up the oven at dinnertime. I love how it helps heat the house while dinner cooks. Roasted vegetables are a true favorite in my house. I mean, in general, I’d rather eat my vegetables fried (hello, French fries) or coated in cheese (hi there, spinach artichoke dip), but let’s be real. I’m an adult and sometimes I have to eat things that are adult-y. Like vegetables that are actually good for you. Roasted veggies tend to pack in the flavor and make me feel good about my choices. So, I figured tonight I’d throw a pan of potatoes and Brussels sprouts in the oven along with some pork chops, all seasoned up with fall flavors. This is such a quick dinner and I love that it all roasts in one pan for minimal clean up. You’re going to need some pork chops, potatoes, and Brussels sprouts. You’ll also want olive oil and a few seasonings. I went with thyme, rosemary, garlic powder, salt and pepper. Simple! 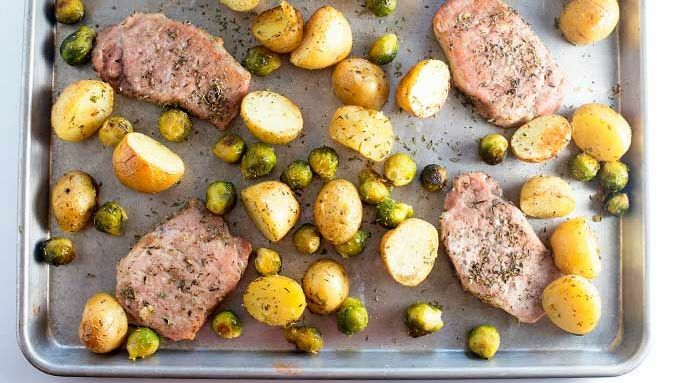 Snuggle the pork chops in between your veggies on the sheet pan and rub them with a bit of oil, thyme, rosemary, salt, pepper, and garlic powder, being sure to coat both sides. Then pop the whole pan in the oven. After 35 minutes, your kitchen will be warm and toasty, your house will smell amazing, and you’ll be ready to dig in!